Today I am sharing my simple, fudgy cocoa brownies made in a fun and festive heart shaped pan that you can make at home with a piece of foil! It is so easy and makes such a big impression, great for Valentine's day, an anniversary or to say "I love you". I baked my fudgy brownie in an 8" heart, but you can make it anywhere between 7-9 inches, just be sure to alter baking times accordingly. 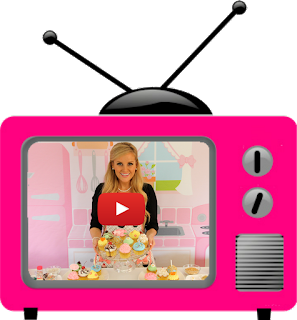 My DIY disposable pans are great for anything from brownies, cookies, cheesecake, to cakes! 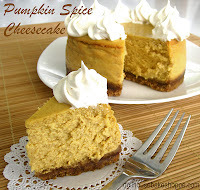 I've made small round pans, perfect for my small batch dessert recipes, like my Mini 5" Pumpkin Cheesecake With Maple Spiced Whipped Cream made in a parchment paper pan. ...or stick with the custom heart shape, like my Mini 6" Red Velvet Cheesecake Layer Cake made in my foil pan. Click on the links to check out the DIY pan tutorials! How about a giant heart pan for a Giant fudge topped cookie cake! Fold a long piece of foil into a long strip about 2-4 inches high. Fold it in half, open ends at top, to create the bottom point of the heart. Overlap the top ends of the foil strip and fold them together creating the top fold in the heart. (Staple to hold the ends together if needed.) Shape foil into a heart with your hands until you have a nice rounded heart (it doesn't have to be perfect, you will re-shape at the end). Take another piece of foil and place it under your heart. 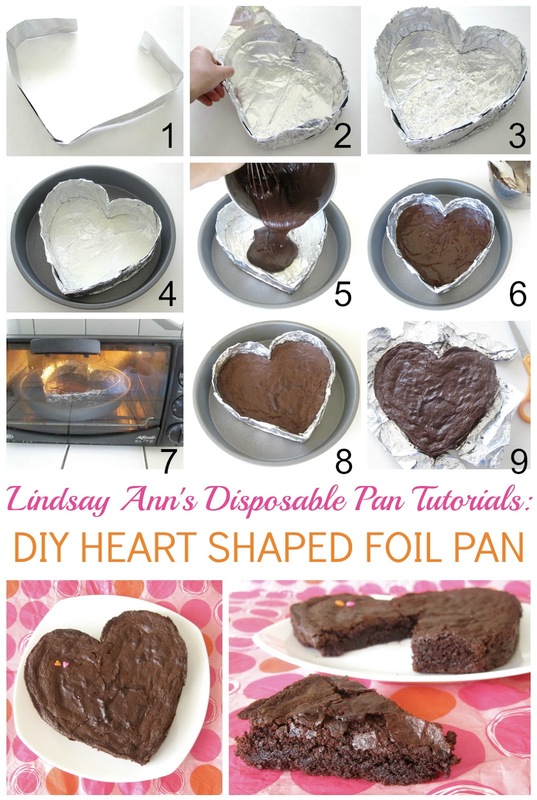 Fold the bottom foil up the sides of the pan, OVER the top and back down the inside walls of the heart. Re-shape pan into a heart shape. Spray foil pan with non-stick spray and place in the middle of a slightly larger, baking pan/cake pan/cookie sheet. Smooth top with a knife or off-set spatula. Bake as directed in a toaster oven or regular conventional oven. *If you like my "DIY disposable pan" technique feel free to spread the word on your blog/facebook/etc., but please make sure you give credit with a link back to this post for the complete tutorial. Thanks so much, can't wait to see all of your creations! Preheat the oven to 350 degrees F. Prepare heart-shaped foil pan (directions above) or use store bought heart pan and spray with non-stick spray. Melt butter in a saucepan over medium heat. To brown the butter, continue to cook, stirring constantly, until brown specks start to appear at the bottom of the pan and butter has turned a light amber color, giving off a nutty aroma (about 5-7 minutes). Reduce heat to low and add the sugars, chocolate, and cocoa, stirring with a wooden spoon until smooth. Remove from heat and stir for about a minute to cool mixture. Mix in the vanilla extract and eggs, one at a time, beating well after each addition. Stir vigorously for about 1-2 minutes until batter becomes thick, smooth and shiny. Stir in the flour, baking powder and salt, until just incorporated, followed by mix-ins, if desired. Pour batter into prepared pan. Bake for about 35-45 minutes. An inserted toothpick will come out with moist crumbs sticking to it. Do not over bake. Cool brownies completely in the pan on a cooling rack before cutting. Once completely cool, slice and serve.